We are an urban species. Homo urbanis is actively reshaping geopolitics, economics and climate action in the 21st century. And with good reason. While the world’s cities cover just 2% of the earth’s surface, they account for 55% of its population. What’s more, they generate 80% of the world’s GDP and over 90% of its patents. Yet they are also responsible for 75% of all energy consumption and 80% of CO2 emissions. Notwithstanding rising expectations of our cities, a surprising number of them are fragile – posing a threat not just to their residents, but to nations and the global system itself. Ours is an urban century and cities are growing in size and number. This is largely due to super-charged urbanization. Roughly two-thirds of the world’s population will live in a city by 2030, and three quarters by 2050. And the vast majority of this growth – around 90% – will occur in lower-income countries in Africa and Asia. China, India and Nigeria alone will account for 40% of all future city growth. Much of this growth will go unnoticed – the transition of rural populations to small and medium-sized cities. Regardless of where it occurs, most new residents will be living not in shiny high-rises, but derelict settlements at the city gates. Breakneck urbanization is giving rise to radically new types of cities that defy traditional patterns of urban geography. Old city planning models no longer apply. Consider the newest “super-city” of 130 million people that combines Beijing and Tianjin. Or check out some of the world’s new crop of “hyper-cities” like Jakarta, New Delhi or Tokyo that assemble 20 million residents or more. Then there are the 29 or so “mega-cities” like Istanbul, Paris or Buenos Aires with at least 10 million citizens. Many of today’s large urban conurbations stretch across nation states and international borders. Some of them are rivalling nation states in power and influence. The expansion of cities is reconfiguring global politics and economics. Most cities are connected through complex infrastructures, services and migration patterns. Today, global supply chains run through them, with many metropolises having more in common with one another than their own nation. Cities are also forging innovative new forms of international cooperation, banding together to demand more stringent climate change commitments, support for migrant groups, and resources to fight extremism. Today there are roughly 200 inter-city networks, more than the number of inter-state associations. The news is not all positive, of course. A minority of the world’s cities are thriving and driving growth. According to McKinseys, 600 cities are expected to generate 60% of all global growth by 2025. The Brookings Institution recently estimated that 123 cities will drive international prosperity in the coming years. But the vast majority of the world’s cities are simply struggling to keep pace – many of them are falling behind and unable to meet the rising demands of their expanding populations. These cities are not growing vertically, adopting smart technologies, or benefiting from the circular economy. Instead, they are horizontal – vast informal slums washing-up on the shoals of the urban periphery. 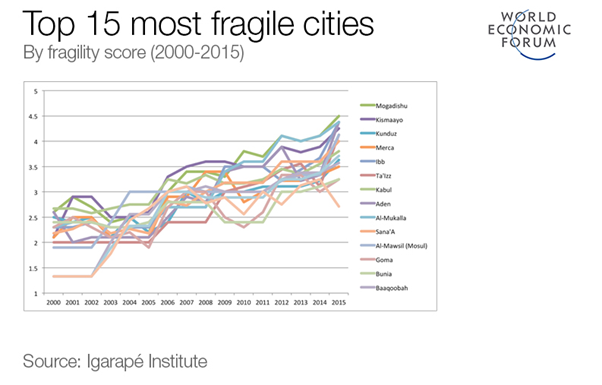 All cities suffer from fragility, but some are affected more badly than others. Fragility occurs when the social contract – the pact between municipal rulers and ruled – breaks down. When city institutions are unable to provide minimum public goods – law and order, basic services, resilience to sudden onset or long-term climate change – fragility deepens. It is not a permanent condition – cities routinely enter and exit fragility – but when risks accumulate then cities and city networks can collapse altogether. While cities are dynamic ecosystems – and the interaction of risks is highly complex and often non-linear – it is possible to tentatively map out urban fragility over time. A newly updated data visualization charts out the evolution of city fragility since 2000. It focuses not just on a subset of global cities, but all 2,100 cities with populations of 250,000 or more. It was developed by the Igarapé Institute in partnership with the World Economic Forum, the United Nations University, 100 Resilient Cities, XSeer and Canada’s Global Affairs. Originally presented at Davos in early 2016 and featured in the Agenda and Wired, 11 metrics of urban fragility are mapped out at the urban scale including population growth, inequality, unemployment, access to electricity, pollutions, exposure to terrorism, homicide rates and reported conflict events. This latest iteration of the data visualization includes several improvements on the original. Rather than a static display of information for the latest year, it is now possible to inspect data for individual cities over the past 15 years. 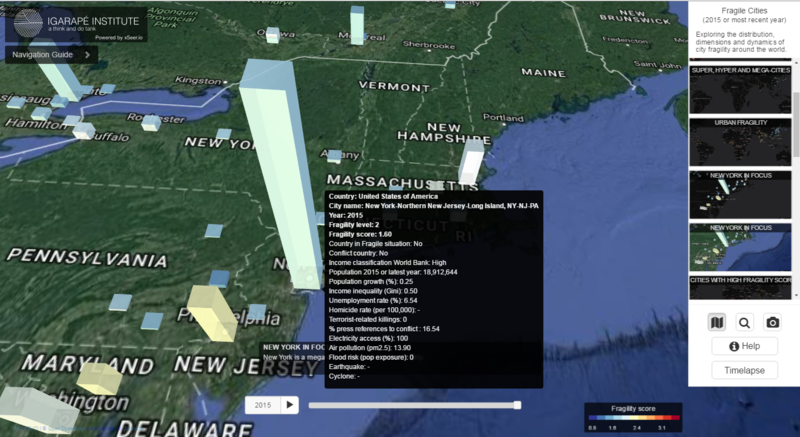 What’s more, if users click on individual cities, a pop-up emerges with a timeline depicting historical trends as well as forecasts until 2030. There are obviously limitations with any predictions – especially when factoring complex cities. The system applies a basic regression with a wide confidence interval, so should be used with these caveats in mind. A handful of key findings stand out from this latest research. First, a surprisingly large proportion of the world’s cities can be described as fragile. According to the latest year on record, 239 cities exhibit “high” of “very high” fragility, about 11% of the total. These cities score above 2.5 on a 5-point scale. Another 346 cities – 13% – register “low fragility” – between 0-1.5 on the 5-point scale. Finally, the majority of cities – 1,489 or 71% – report “average fragility” between 1.5-2.5. The average fragility score across all cities is 1.91. A total of 425 cities are above the global average, and the remaining 1,183 fall below. Second, city fragility appears to be worsening over time, especially in lower- and middle-income settings. There is a marked trend over the past 15 years towards greater fragility across many, if not most, parts of the world. These shifts are not restricted to low-income settings and medium-income environments where the number of fragile cities grew by 26% between 2000 and 2015. Indeed, medium-income and high-income settings also witnessed a growing number of fragile cities – 7% and 14% respectively. Nor are they confined to fragile and war-affected countries, but are spread more widely, including in ostensibly peaceful countries. Third, there are diverse drivers of city fragility that vary from region to region. For example, rapid population growth, terrorism, conflict, low electricity coverage and pollution are key risk factors driving urban fragility in the Middle East and Central Asia. In Central and West African cities, the persistence of conflict, unemployment and electricity coverage are the strongest determinants. Meanwhile, in Central America and the Caribbean, high rates of inequality, unemployment, homicide and flood and cyclone incidence make the difference between whether cities have higher or lower fragility scores. By comparison, low population growth, low inequality, full electricity coverage, low homicide, low terrorist-related deaths, and low risks of natural hazards explain the resilience of the majority of cities in Europe and North America. Fourth, city fragility is not evenly distributed, but rather concentrated in a few regions and time-periods. The most fragile cities are clustered in the Middle East and North Africa, West Africa, Central Africa, Central Asia and Central America. Cities in Iraq (since 2004), Libya (since 2011), Syria (since 2011) and Yemen (since 2008) stand out. Likewise, all cities in Somalia and Somaliland (since 2006), South Sudan (Juba since 2010) and Sudan (especially Nyala since 2011) are exceedingly fragile. Meanwhile, the eastern cities of the Democratic Republic of the Congo (since 2011), Nigeria’s Abjuja, Kano, Kaduna, Port Harcourt and Warri, and Mali’s Bamako all register acute fragility. There are also disconcerting signs of urban fragility in the Philippines, especially Pasig, Lapu, Cotabato and Davao. Fifth, there are warning signs in other parts of the world, namely South and South East Asian cities, and cities in parts of South America. Cities that are facing particularly high fragility scores include Kabul, Kandahar, Balkh, Kunduz, Herat in Afghanistan; Karachi, Quetta, Peshawar, Faisalabad and Rawalpindi in Pakistan; India’s Lucknow, Patna, Kumool, Kolnapur, Dindigul, Imphal; Bangladesh’s Chittagong and Dhaka; and Myanmar’s Bago, Monywa and Mawlamyine. Some Chinese cities also register signs of medium fragility, including Tianjin, Shenyang, Guangzhou, Wenling in 2005, and Fouzhu in 2001. There are also red flags for several northeastern Brazilian, Colombian and Venezuelan cities. 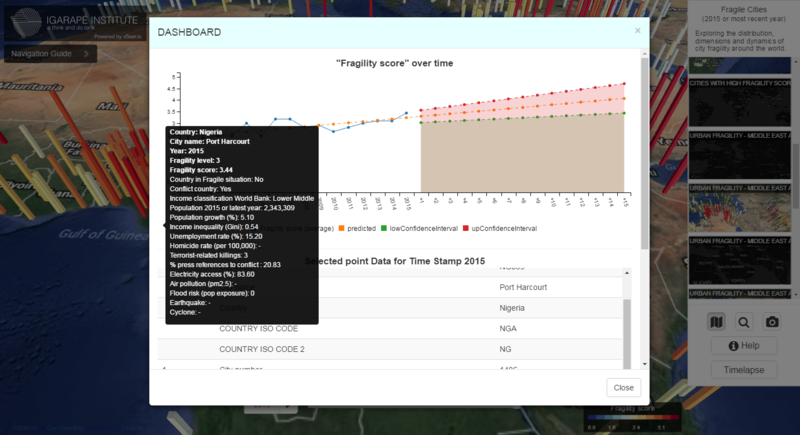 Sixth, there are pockets of cities reporting low fragility scores. For example, most Australian, Canadian, Finnish, northern Italian, Japanese, Norwegian and Swiss cities experienced only very minor increases (and in some cases declines) in fragility over the past 15 years. 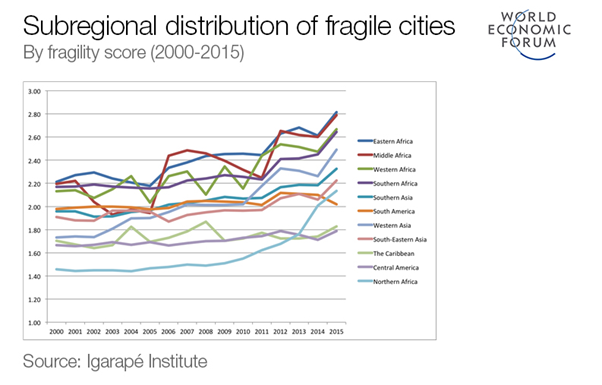 Some cities experiencing declines in fragility include Cuba’s Havana, Bogota and Medellin in Colombia, Rwanda’s Kigali, Ethiopia’s Addis Ababa, various cities in Morocco and Singapore, Indonesian cities such as Malang, Kederi, Bandar Lampung, and also Japanese cities (with some exceptions such as earthquake-prone Fukuoka in 2005, Shizuoka and Mito in 2008, Mito in 2011 and Morioka in 2012). How fragile are our cities? Seventh, there are some parts of the world that register counterintuitive levels of urban fragility. For example, while most US cities report low and medium levels of fragility, there are a scattering – Albuquerque, Baltimore, Jacksonville, New Orleans, Philadelphia and Riverside, among them – that exhibit higher than expected volatility. Likewise, most Mexican cities exhibit lower fragility scores than one might expect given drug-related violence there. Ciudad Juarez – once the world’s most violent cities – witnessed a dramatic decline in fragility over the past few years. Certain cities in tough neighborhoods – including Muscat (Oman), Quo (Iran), and Samarkand (Uzbekistan) – also report surprisingly low fragility scores. Eighth, a clutch of cities register tremendous resilience to fragility. Cities buffeted by political, economic and natural shocks such as Port-au-Prince have struggled. The city saw an already high fragility score rise from 2.67 in 2000 to 2.9 during the coup in 2004; this then dropped down to 2.58 before the 2010 earthquake and then spiked upwards to 2.75 in 2010, 2.91 in 2012 and 3.1 by 2015. Meanwhile, Medellin’s once high fragility score dropped from 2.69 in 2000 to 2.17 by 2013, reflecting a stunning turn-around. Finally, Mito, in Japan, experienced several earthquakes since 2000. The city’s fragility score oscillated between 1.56 and 2, before returning to 1.71 in 2015, suggesting a remarkable resilience. The data visualization provokes a series of reflections about the underlying causes of fragility. For example, what are the relationships between wider changes in climate and city fragility? Take the case of Syria’s war, which is typically ascribed as a complex mix of a violent crack-down and geopolitical interests. 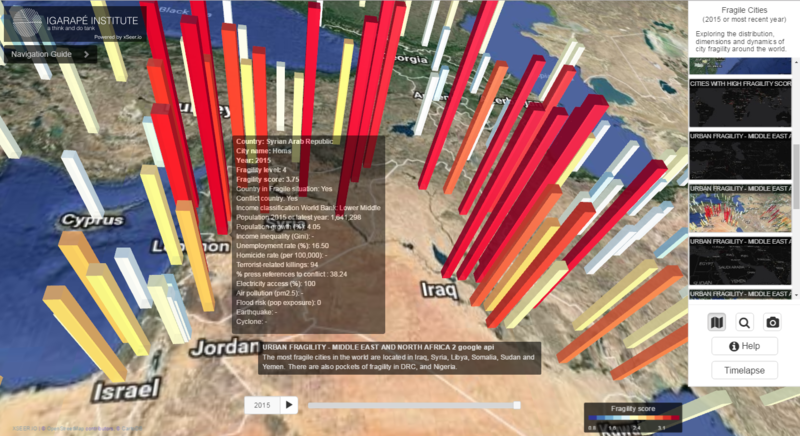 The fragile cities data visualization confirms the deterioration of Syrian cities after 2011. Yet the story is clearly more complicated. Indeed, satellite maps such as those developed by Carnegie Mellon’s Earth TimeLapse reveal droughts that affected the country from 2006-2010. These were the worst in over 500 years and resulted in the failure of 75% of the country´s crops. After the failure of harvests and loss of livestock more than 1.5 million people were displaced, many of them to cities like Aleppo, Damascus and Homs. Social unrest clearly also contributed to an escalation of the conflict. There are also potential relationships between land use patterns and urban fragility, including in Africa. For example, consider rampant deforestation in the Kivu region of eastern DRC. As forests were denuded for fuel and populations forced off land for mining, many people flooded cities bordering Lake Kivu and Lake Albert further north on the border with Uganda. Cities such as Bukavu, Bunia, Goma and Bujumbura – already reeling from numerous conflicts – became increasingly fragile as a result. Similar types of patterns are likely observable in other forest- and resource-rich areas of South America and Africa. The global community is facing several short- and long-term mega threats in the coming 15 years. Alongside unregulated turbo-urbanization is the potential for catastrophic nuclear conflict, pandemics, resource depletion, climate change and massive technological change. These challenges are volatile, uncertain, complex and ambiguous. Nation states and multilateral institutions are proving unable or unwilling to address many of them. Like the canary in the coalmine, fragile cities can help reveal the health of nations. Cities may also turn out to be keys to building a safer world. For their part, cities face real challenges in the years ahead – especially since they are increasingly dependent on international supply chains for meeting basic needs. Linked economies generate obvious benefits, but they can also exacerbate vulnerability. More optimistically, cities are offering practical new ways to work in networks and tackle problems affecting the global, and metropolitan, commons. But to meet the great perils of this century, mayors will need to be better informed than ever. Data visualizations can help, but they are only a beginning. Cities will not survive if they rely on preventive strategies alone. They must also invest in adaptation and mitigation. This means finding ways to design-in urban resilience and taking advantage of inter-city networks to better navigate the coming storms. Thanks to Katherine Aguirre from the Igarapé Institute for contributing to this article. Credit is also due to colleagues at the Global Parliament of Mayors and C40 for their inputs. Would AI be better at governing than politicians?